Lotus Notes has been on the market since 1989, and has remained until now a part of the IT ecosystems of many companies. In the recent years, however, there has been a significant movement away from Lotus Notes to more modern solutions than IBM’s aging product. The most common reason why companies migrate away from Lotus Notes is to replace the e-mail infrastructure, which is often not up to users’ expectations. In the majority of these cases, organizations decide to make the transition to Microsoft Exchange, since it is the market leader for corporate users. E-mail migrations tend to be just the first step of what becomes an organization-wide migration to a modern IT software infrastructure. The necessity to maintain business applications based on Lotus Notes motivates organizations to invest deeper into the Microsoft stack, which culminates with implementing SharePoint. Whether on-premises or in the cloud, SharePoint provides many useful out-of-the-box features. Of most interest to those migrating are SharePoint Lists, Libraries, pages, etc. capable of supporting most Lotus Notes applications with relatively little effort. Third-party tools are also available, significantly enhancing the migration. Migration of e-mail services and basic features is not typically the end of the migration.. For many years, Lotus Notes has been widely used to deliver workflow-based applications for many companies. 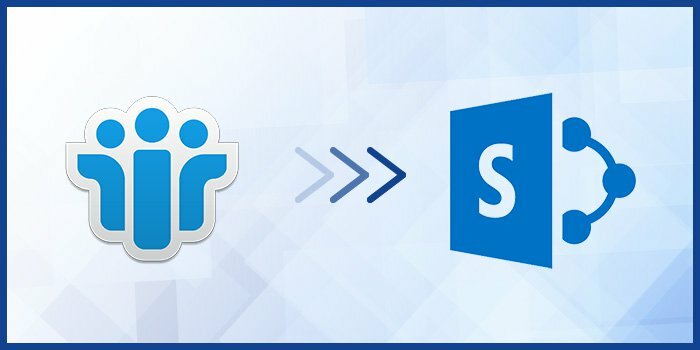 To prevent a situation where two competing IT ecosystems are in place (Lotus Notes and SharePoint), organizations have decided to migrate workflow-based applications to SharePoint as well. Unlike a simple e-mail migration, there is no tool on the market that is capable of automatically migrating complex applications into SharePoint environment. It is worth keeping in mind that many companies developed sophisticated and complex workflow solutions, making a potential migration even more difficult. In cases like this, the only solution is to re-create them from a scratch in the new environment. To avoid the .NET coding required to extend the initial capabilities of SharePoint, third-party solutions like WEBCON BPS are often chosen, providing extensive workflow and forms capabilities. This allows users to re-create their business applications in a low-code manner, which is significantly easier and quicker compared to custom coding. As a true Rapid Application Development (RAD) platform, WEBCON BPS is equipped with plenty of features that make migrating workflow-based applications from Lotus Notes to SharePoint quick and painless. Highly sophisticated workflow engine – WEBCON BPS uses a proprietary engine proven in “battle” by hundreds of companies around the world, using the most complex business processes imaginable. Looking to migrate your existing Lotus Notes applications into SharePoint? Get prepared with Andreas Schmidt, Lotus Notes expert, who provides us with technical insights into the transition process.